Dubai, United Arab Emirates - 14 June 2018. The kitchen is the heart of the home: a place to feel good, to cook together and to indulge. And there is one spot in the kitchen where everybody stops at countless times each day for filling pots, preparing vegetables and washing up after a big meal: the kitchen sink. With its unique and high-quality kitchen sinks range, GROHE, the world's leading provider of sanitary fittings, now sets new standards, making every use of the sink less of a chore – the ideal interplay of form and functionality in modern kitchens. GROHE sinks have been designed to be a PerfectMatch: Not only do they fit every type of kitchen scheme but can also be paired effortlessly with GROHE's kitchen faucets and water systems, both in terms of design and practicality, with comfortable proportions and no splashing. Due to the QuickFix system and reversible designs as standard, the GROHE kitchen sinks, which are available as compact models with integrated drainers, large double sinks or chic built-in sinks, can be installed in minutes with no fuss or hassle. Another plus are features like the noise-reducing GROHE Whisper insulation or the automatic waste that means never plunging one's hand into dirty water again. This stainless steel is known as “marine steel”, since it is used primarily in the shipbuilding industry. In this version, the sink is particularly suitable for regions with high salinity. With the patented GROHE Satin Finish brushing process with special vegetable fibres (Tampico), the steel used for the sinks has a particularly smooth and therefore easy-to-clean surface. In addition, practical accessories such as multifunctional surfaces, attachable chopping boards or graters can be added. Hence, the selected model and the price fit the user's lifestyle perfectly. Well thought-out solutions make many steps in the kitchen easier. Whether one needs various sink sizes from compact to extra-large or integrated sink strainers – GROHE kitchen sinks including one, one and a half or two bowl options, provide many innovative details. Also, the water drainage function with an external control knob convinces quickly: It allows to empty the sink without reaching into the dirty water. Thanks to the unique GROHE Whisper insulation, noises caused by run-off water or handling of pots and pans are reduced to a minimum. In addition, the overflow, available for all GROHE sinks, avoids any spillage of water in case the faucets are inadvertently left open plus good drainage is ensured by the elegant diamond-shaped creases that make the water flow away more easily. 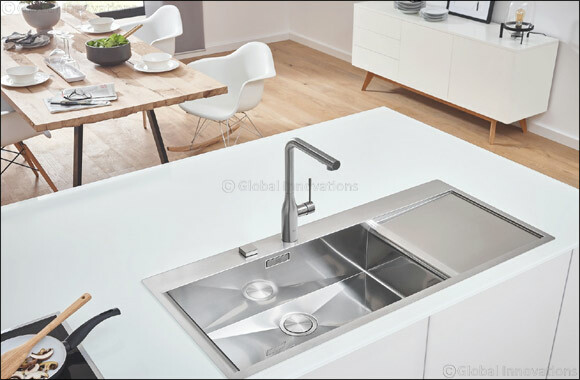 Another highlight: The kitchen sinks can be installed very easily due to the QuickFix system and reversible designs as standard as well as two pre-punched faucet holes and an under-sink siphon complementing the scope of delivery and guaranteeing an all-in-one solution. Having a large selection of sinks and fittings, combined with different extras, it can be hard to choose from. Therefore, GROHE has put together four perfectly harmonising complete bundles consisting of a sink and faucet in the popular Bau, Eurosmart, Concetto and Minta lines.